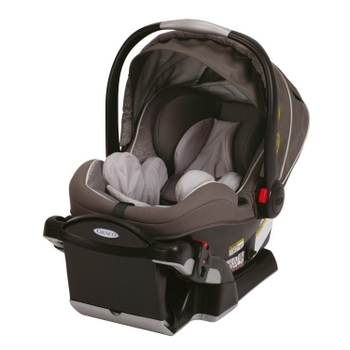 If you’re looking for a car seat that will comfortably seat your baby from birth to 40 pounds, look no further -- Graco has done it again with the introduction of the SnugRide Click Connect 40. Did you know? The American Academy of Pediatrics now recommends that children remain rear facing until at least their second birthday -- and really, longer, as long as they fit within the height and weight range of their particular seat. As the name implies, The SnugRide Click Connect 40 (Babies R Us, $220) allows your little one to rear face from 4 pounds to 40 -- so it should last until your child is over 2 years old (for example, my daughter will be 3 in 3 months and is 30 pounds). It features the Click Connect technology which allows mom and dad to transition their baby from the car seat to the stroller with one simple click. One reason moms and dads may hesitate to keep their babies rear facing for the recommended time is that they worry that their little one will be uncomfortable due to lack of leg room. Kids usually cross their legs or let them dangle over the sides with no complaint, but Graco has included an adjustable base (eight different positions!) for when your kiddo gets to be on the big side. This is revolutionary -- and may give you peace of mind. Another thing that parents will love is the Simply Safe Adjust harness systems -- you can adjust both the headrest and the harness with one hand, which eliminates the need to take the seat out and rethread the entire thing. Brilliant!